As I prepared for my phone call with Melissa Joan Hart—the woman whose TV show, Sabrina the Teenage Witch, helped me get through some of the toughest years of my life—I did what any self-respecting girl freaking out would do: I called my mom. My mother calmed me down, and as a reporter with hundreds of interviews under her belt, she gave me the pro-tips I needed. Some people tell you “don’t meet your heroes,” but when your hero talks to you about Halloween and your favorite TV show and what it’s like to be a female director in Hollywood…I’d say it’s probably okay to meet them. HelloGiggles (HG): A lot of the actors who worked on Sabrina were comedy heavyweights. You had Martin Mull, Caroline Rhea, and Paul Feig, to name just a few. As a young comedienne and actress, did you learn anything from those veterans that you really took to heart? Are there any particular moments together that you remember? Melissa Joan Hart (MJH): You know, it was more of a personal…It was more of us sitting and having lunch together every day, and chitchatting about life, and getting their advice. I remember Martin Mull telling me that he takes every job that comes his way because he’s so afraid it’s his last. I was like, “Oh my God. That’s like me.” …So, still to this day, I think about him. Every time I go to take a job I’m like, “Am I just taking this job because I want to take a job or is this the right thing for my career?” …I went to his studio and saw his artwork and I still have a piece hanging on my wall. HG: You’ve transitioned into directing, which is very exciting. Would you mind telling us a little bit about how that’s been for you? Are there any unexpected challenges that you’ve faced? MJH: I started directing on Sabrina and even then, even with that amazing crew behind me, I still had some people kind of looking down at me, a little bit like, “What are you doing here? You’re just a little girl directing this show.” It was tough love, too. “You know what? You want to be the boss, be the boss. Make a decision.” So, they taught me a lot through tough love…It taught me early on that I have to know my stuff, I have to be prepared. Moving on past that, I directed a short film after [Sabrina] ended because I really wanted to showcase my more creative side with directing, a more storytelling side. I’m not a writing director, so that makes it a little difficult for me, but I love to take someone else’s story and bring it to life. Then, most recently with Watcher in the Woods and directing some of The Goldbergs, it’s always kind of challenging. But the great thing for women and minorities right now is that we have these diversity programs put in place at all the networks. …I actually just went to the centenary celebration of Ida Lupino—one of the first female directors in the DGA [Director’s Guild of America]. She would’ve been 100 this month, and they had a little celebration showing some of her work. That was really exciting to learn about one of the first female directors directing herself. And it was groundbreaking. HG: Do you see yourself continuing with directing, or is acting still your first love? MJH: I really like to mix it up. When I directed Watcher in the Woods it was so wonderful. Such a creative outlet for me. I really loved every moment of that, but I was exhausted at the end of it after directing it. It just blows my mind to the point where I just sometimes can’t even keep my eyes open. I feel like my brain is fried. While we were shooting it, I turned to my mother, my producing partner, and I said, “All right. I just want to be in a Christmas movie. I just want to make people laugh and put on pretty dresses. I’m done being the boss for now.” So, I found a Christmas movie. Then, halfway through that, I called my mom and I’m like, “All right. I’m done. I’m ready to be the boss again, find something else.” I really like to go back and forth. I think I need both in my life. This year was going to be a great growing year for me as a director, but then I got this new show on Netflix [No Good Nick]. My acting career kind of is overpowering my directing career right now. I would love to be able to do both…I have a five-year plan for my directing career, let’s just say. HG: Would you mind telling us a little about what it’s like to produce with your mother, who is your producing partner at Hartbreak Films? MJH: In my 20’s/30’s I would’ve said it was a little bit…It’s challenging, it’s difficult. It’s hard to know when family ends and work begins. But at the same time, who do you trust more than your mom? Especially with your career. She’s always looked out for me. If she’s ever crossed my path in a bad way, it’s just been because she was doing what she thought was best for me. It’s always been a really lovely relationship and it actually keeps us talking probably more than we necessarily would because we have to talk about business—my family is not big phone talkers; we like to wait until we get moments to catch up. So it keeps us on the phone more and just keeps us in touch about the everyday stuff, which is nice. Like I said, who do you trust more that your mom? We’ve really grown my career together, and I hope we continue to do that until the day we die. I mean, it’s not always rainbows and unicorns; it’s definitely got its tricky days, tricky months, and tricky years. But, for the most part, it’s really lovely. HG: Since we are coming up on Halloween and you know all about that time of year, I’m wondering how you and your family celebrate the holiday? MJH: I love any holiday. I love any reason to dress up. 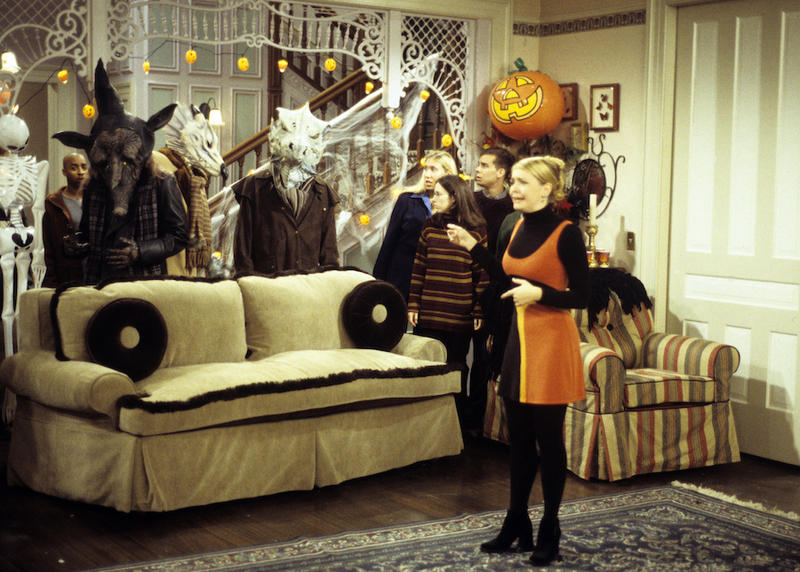 I really like to get into any holiday and Halloween…Our biggest [Sabrina] episodes were our Christmas episodes and our Halloween episodes. It’s always been, for me, a special holiday though, from when I was a kid…I still feel that way about it, and with my kids, even more, [I feel] special making their costumes, or going out with them trick-or-treating. This year I was not going to be able to be with them, because it’s on a weekday and I’m working. But, I am going to fly out and help them count their candy, and then I’ll have to leave at the crack of dawn the next day to go back to work…I don’t want to miss a Halloween with them. You only get about 13 before they’re off with their friends or not wanting to dress up anymore, so I really want to make sure I’m here for it. I haven’t thrown a Halloween party in a long time, except that we’ll sometimes have people gather at our house before trick-or-treating. We’ve come up with some great recipes. One is like a seven-layer spider web dip that is so delicious. [I make it] with Heluva Good! French Onion Dip mixed in as the sour cream layer of a seven-layer dip, with all the other yummy stuff: the salsa and the guacamole and the cheese. [For] Halloween candy…I’ve always been a fan of Twix bars. When I was on Clarissa Explains It All, everyone on the show knew that Twix was my favorite candy bar and for my—I think it was my 16th birthday, everyone decided to get me a case of Twix. So, I had those in my freezer for about a year. I got a little burnt out on them for a while after that, but [that’s] still where my heart goes.